While many people pay book designers to format their books, it is not hard to turn an ordinary Microsoft Word manuscript into a professional looking ebook. In this manual, the author, who has years of experience producing professional print and ebook files for satisfied clients, will show you how easy it is to do, and share the practical tips and tricks she has learned to make the project go smoothly. 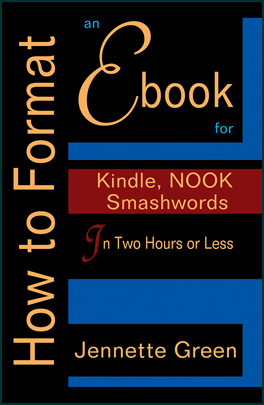 Learn how to easily turn your Microsoft® Word manuscript into a Kindle, NOOK, or Smashwords files in two hours or less. * Make your publishing dreams come true today! * If your book includes a number of images and/or complex formatting, converting your book make take considerably longer than two hours. This manual is best suited for fiction novel, or general nonfiction books. If your book requires a great deal of specialized formatting, please note that this book does not cover the use of CSS, html, KindleGen, NCX files, or other advanced Kindle formatting issues. If this area is of interest to you, the purchase of a separate book covering these topics is recommended. Have you written a fiction novel or a nonfiction book that you would like to publish in ebook format? Would you like that book to become available in the popular ebook formats, such as Kindle, NOOK, and Smashwords? You can do it, and it is more simple than you could imagine. I have spent the last several years formatting and preparing clients’ book files for Kindle, NOOK, Smashwords, Lightning Source, and CreateSpace. All of my clients have been very pleased by the look of their books, and every file was accepted by the online distributors. While many people pay book designers (such as myself) to format their books, I’ll tell you a secret—it is not hard to turn an ordinary Microsoft® Word® manuscript into a professional looking ebook. I will show you how easy it is to do, and share the practical tips and tricks I have learned over the years to make the project go smoothly. This book will give you simple, step-by-step instructions on how you can use Microsoft Word 2003 or Microsoft Word 2010 to create a quality, professional looking ebook, ready for upload to Kindle’s KDP platform, Barnes & Noble’s PubIt! platform, and Smashwords. Are you ready to publish your book? Open up your Microsoft Word document, and let’s begin! As mentioned in the first book in this series, How to Format a Print Book in 12 Easy Steps, I always format my print book files with a view to converting them later into ebook formats. As I will usually convert every print book into an ebook, this makes sense for me. 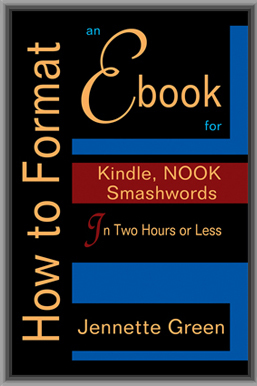 The three major ebook formats that I will cover in this book include: Kindle, Barnes & Noble’s NOOK, and Smashwords. A chapter about creating files for LSI’s ebook program is included, as well. I always create the Kindle file first, and then use that base file to create the other file formats. When I explain how to format the Kindle file, you will notice that I’ll also take into account Barnes & Noble and Smashwords’ requirements. 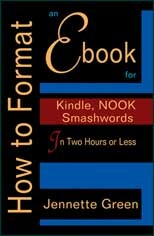 Smashwords has a style guide that is helpful for converting any document into an ebook format. I’ve found that if I follow their guidelines, all of my ebooks turn out right the first time. Formatting ebook files is surprisingly simple, as long as you follow all of the steps. Let’s start with Kindle. Using the “save as” function, rename your Microsoft Word .doc, in order to preserve your perfect print file. Perhaps naming your ebook file “MyBookKindle” would be helpful. I also like to save my ebook files in a separate folder. It helps to keep them all in one place, and separate from the print file. As you’re saving your file, please keep in mind that Smashwords only accepts the Microsoft Word .doc format. Not the .docx format. If you’re working in Microsoft Word 2010, now would be a good time to save your document as a .doc file. Use that .doc file as you work through the ebook section of this book.